My name is Dr. Steve G. Jones, Ed.D. and I have been helping people improve their lives through hypnosis for over 25 years. And how I do it is rather simple. You see, our reality is nothing more than our perception of reality. And our perception of reality is created within our subconscious mind. Therefore, the key to creating the reality that you desire is to program your subconscious mind to manifest that reality. While the concept itself is simple, getting people to do this can be easier said than done, in some cases. And the reason behind all this is that without even realizing it, the subconscious mind is so strongly programmed, that changing it almost seems impossible. Take a person who wants to achieve financial freedom for example. Consciously, they don’t ever want to work for someone again. They are tired of living from paycheck to paycheck. They want the best things money can buy. Yet their reality is much different. They either never succeed at the attempts that they make or they never even make those attempts to begin with. And the result is that they wind up unhappy because they never have enough money to be financially free. The reason why this happens is because within the subconscious, is a thought process which is much more powerful than that which occurs in the conscious mind. And if the thoughts within the subconscious are different than those which you consciously believe, you will always manifest a reality that you may not desire. So the bottom line is that you can consciously want all the money in the world, but if you subconsciously believe it won’t happen or that it’s just too hard, it will be. After years of developing powerful methods to effectively help people achieve the alpha state, I began realizing that while people would come to me for many different reasons (ie. to lose weight, stop smoking, control their tempers, etc. ), there was a root problem existing in many people that could still halt their ability to achieve results. The root problem is the lack of the characteristic that I mentioned earlier. It’s called confidence, and without it nearly every attempt that you make at achieving a goal will probably be shattered into a million pieces. For example, if you have all the great qualities of a partner, but lack the confidence to make a decision to act in a way that would bring you closer to a partner, you will probably wind up alone. If you want to land your dream job, but lack the confidence to make the decision to act in a way that would bring you closer to that job, like furthering your education, gaining more experience or approaching the person who could provide you with that job, you will probably wind up without your dream job. The bottom line is that confidence is a resource which is both invaluable and essential toward the achievement of just about any goal. With that being said, I decided that since it was taking up so much time for me and costing too much money for others ($2,500 a pop) to travel to my Savannah office for a private session to build and restore confidence, that I would create a resource that anyone could use to instill confidence within themselves using the power of hypnosis right in the privacy of their own home. It took quite a bit of time, energy, money and some good old fashioned hard work, but in the end, I was happy to say that I fulfilled my mission……almost. You see, while it’s true that to change the behaviors which influence the decisions that one makes to lead them toward success, you must re-program their mind on a subconscious level. When you’re dealing with something like confidence, things can get a little tricky. Reason being is that confidence is nothing more than belief in oneself and one’s powers or abilities. As you can see, this is why confidence really governs every attempt at programming the subconscious mind for success. For example, I could show you every winning play involved in a sport, but if you never have the confidence to put it to use, it will never benefit you in any way. And for that reason, instilling confidence in someone takes much more effort than just about anything else. In essence, one needs to focus on two areas: subconscious thoughts and emotions. They serve as the fuels for the creation of life, war, death, marriage, love and just about everything else in life. And negative emotions can have an extremely destructive effect on one’s level of confidence. And because of that, it takes a little bit more work. My years of research and study in hypnotherapy combined with my education in cognitive psychology not only provided me with an abundant amount of knowledge when it comes to how the mind works and how people learn, but I also had mastered every effective technique that could be used to implement this knowledge. I knew that my system was as close to perfect as perfect could be, but I felt something was missing. And that something was the component which would deal with people’s emotions. 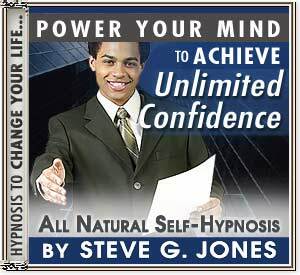 You see, my system would equip any person with the transcendent ability to develop confidence using the power of hypnosis, but if they had negative emotions, the process would take much longer. If a person develops the confidence to act, but cannot control the negative emotions which prompt them to do otherwise, they still will not act. Now I know from years of experience and research that when it comes to dealing with negative emotions there simply is no better option than that of Emotional Freedom Technique or EFT for short. For those of you who aren’t familiar with EFT, it’s an incredible healing modality, which is based on the same principles as the age old techniques found in acupuncture, only without the use of needles. It basically works by changing the body’s energy. Dr. Roger Callahan (the man whose findings led to the creation of EFT) hit the nail right on the head when he said, "The cause of all negative emotions is a disruption in the body's energy system." Since Dr. Callahan’s findings, EFT has transformed into a powerful energy-based therapy developed by Gary Craig, which has been used to provide rapid relief from physical-emotional issues (e.g. Trauma, PTSD, Phobias, Grief, Anger, Guilt, Anxiety, Addictive Cravings, Nightmares, Abandonment, Fear of Public Speaking, Fear of Flying, Love Pain, Depression, Pain, Headaches and much more). Trained and certified at the respected Hypnosis Motivation Institute in Tarzana, CA, where he served on staff, Brad has made quite a name for himself by combining this background with training in energy psychology and various schools of thought in the area of personal growth and achievement. happiness in their lives and has had the privilege and pleasure of working with a diverse group of clients, from CEO's to professional and NCAA athletes, from chiropractors and psychiatrists to corporate and federal attorneys, from award-winning actors to residents at a program for homeless men and women in Santa Monica. He has also been a presenter at a number of events, including several International Energy Psychology Conferences and the Walk On Water (WOW) Fest in Los Angeles. expert in the film “Try It On Everything” along with Jack Canfield, Bob Proctor, Dr. Norman Shealy and Dr. Bruce Lipton. Let’s just say this guy is the “go to guy” when it comes to personal development, particularly through EFT. And he had exactly what I needed. As you can imagine, with his huge roster of clientele and traveling schedule, Brad isn’t exactly the easiest guy to get in contact with. For weeks, my marketing team, my editor and just about everyone else on my staff tried to track him down. “Can’t do it” I replied. “If we can’t get Brad involved, there’s no point in even pursuing the matter”. Trying to replace Brad’s expertise and what he brings to the table when it comes to EFT, is like trying to replace a screw with a nail, it just won’t work the same. And so we persisted…….and persisted….and persisted a little more. And finally, after months on end, my secretary got Brad on the phone. As she was on the phone with him, I happened to be walking into my Savannah office fresh off a plane from New York and heard her say “Yes, Mr. Yates”. I dropped my bags and grabbed the phone right out of her hands (juggling it like a hot potato) because I knew that no one would be able to convey the message to Brad like I would. I told him that while subconscious thoughts control everything, they can be easily influenced or changed as a result of negative emotions in action. Brad was amazed that I had called him to talk about confidence because he also knew how important it was to the process of achievement in anything a person can do. And he also knew that hypnosis (when combined with EFT) serves as the ultimate formula for building confidence. I asked Brad if he was willing to take some time out of his busy schedule to put together a resource on building confidence through EFT that could be coupled with my program which was based on hypnosis. He not only agreed to help, but he said he would go one step better and perform a live teleseminar where he would disclose the step by step process for tapping into confidence and allow me to record every bit of it. The result was something so powerful and mind-engaging that it could almost be called super-natural. The Power Of Future Focus - Learn how to remove labels you have been given in the past. Confidence Rejuvenation - Re-create confidence from within yourself. How To Increase You Self Worth – Learn to give your self-esteem a permanent boost. PMA Mastery – Here you will learn everything you need to achieve and master a positive mental attitude. How To Attract A Positive Confident Energy Into Your Life – All negative emotions are the result of the body’s energy being disrupted. Here you will abolish that problem forever. Universal Confidence – Learn how to exude confidence in all aspects of life including dating, sales, and any other situation. Confidence In Communication - Learn to be confident when speaking to people under any circumstances or in any situation. Discover Your Inner Voice – Once you become aware of your talents and abilities, your confidence will naturally peak. Natural Confidence Support Systems – Discover the power and privilege of being assertive and self-assured. Goal Centered Confidence – Here you will build the confidence needed to attain any goal that you set your mind to. Self Confidence Hypnosis - Use hypnosis to fuel your confidence at any given time. The Power Of Effective Communication – Here you will become an amazing conversationalist which will ensure your confidence when speaking to people. As you can see, I made what may be one of the best decisions of my life by being persistent in my efforts to get in touch with Brad because the end result is something that neither of us could have accomplished on our own. And that's what truly makes this Confidence Beyond Belief resource different than anything else on the planet. 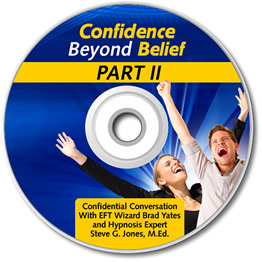 "The Confidence Beyond Belief program is the breakthrough I needed. I procrastinated starting my business for 5 years due to self-doubt. After going through Brad and Steve's program I'm launching my business with full-confidence I will be successful." You see, you can search high and low until you are blue in the face, but you will never find a resource as empowering as this. Before I go any further, realize this; a system is only as effective as your ability to use it. In others words, you can flood your mind with tons of knowledge, but if you fail to engage your mind mentally so that you can apply it, it’s basically useless. Here is a perfect example. Have you ever purchased a book and were so impressed with how informative it was, only to realize that all it consisted of was information that you really couldn’t do anything with except perhaps use it for substance in casual conversation? The unfortunate reality is that many so called “life-changing” resources are just that; mere references. They only succeed in doing half the job which is educating and enlightening you with information that you didn’t have before you purchased the resource. But many of them fail miserably in the application aspect. In other words, they do not succeed in providing you with a system that you can actually use to apply the information that you learn. And I refused to let Confidence Beyond Belief fall in to that category…which is why I decided to take things one step further. After I spent months tracking down Brad Yates and getting him to record an exclusive teleseminar, while at the same time spending hours a day in the recording studio with my sound engineers perfecting the hypnosis recording, I decided the best way to show you how to apply the profound knowledge found in this system was to have both of us apply it right in front of you. And so I once again got Brad on the phone and asked him if he would be comfortable performing an EFT Confidence Tapping session on me while I performed a Hypnosis Confidence Induction on him. That way, people could see exactly how the system works without any kind of guess work involved. I guess you could say this was the final stone that needed to be turned for this system to really be effective in every capacity. The Reality Of Success - Learn to believe that success is possible. The Power Of Abundance – Once you realize that an abundant life is possible, it will become your reality. Inner Self Confidence - Discover the source of confidence from within you. EFT Confidence Mastery - Learn the empowering techniques of EFT (emotional freedom technique). Goal Achievement Mastery - Learn to feel worthy of meeting your goals and make them a reality. Tap Your Way To Freedom - Discover the importance of the tapping technique and how it will change your life. Shatter Your Self Doubt - Free yourself from self-doubt once and for all. EFT Mastery – Become inspired from Brad using EFT on Steve. Discover Your Inner Self - Empower yourself to find out who you really are so that your confidence will soar. Implant Confidence Permanently - Learn to subconsciously program confidence forever. Confidence Through NLP - Use NLP to anchor confidence permanently. So let me ask you this, after seeing what you will discover and how your life will be flooded with confidence, can you think of any reason why you do not want to change your life today? Can you think of any good reason why you would not want to instill within yourself the confidence that you’ve always wanted? Are you ready to face any situation and/or circumstance whether good or bad with unshakable confidence? I hope you answered yes because aside from creating the single most effective resource for building confidence on the planet through the power of hypnosis and EFT and pairing it with a fullproof system to apply what you learn, Brad and I are going to make owning Confidence Beyond Belief as affordable as humanly possible. Anyone who knows Brad Yates knows that a live EFT teleseminar from him could easily be sold for hundreds and still be considered a great value as many others that he has done have proved it time and time again. My hypnosis recordings sell for $79.95 on average and are considered a great deal by many at that price. Now couple those 2 points with the fact that we are including a live recording of Brad performing an EFT session on me and me performing a hypnosis session on him (just to further insure your success) and what you have is something so powerful and unique that could easily be sold for hundreds and almost be considered an outright steal at that price. However, because Brad and I are so passionate about what we do and we know that if there is one area that everyone should improve, it is confidence, we are going to practically give Confidence Beyond Belief away for just $79.00 $49. Knowing that your confidence level is going to not only govern every decision that you make but is also going to have a direct impact on the quality of life that you experience, don’t you think you owe it to yourself to own Confidence Beyond Belief for just $79.00 $49. Okay, now that you understand exactly how important confidence is and how Confidence Beyond Belief will change your life, you have three options. Ignore everything you have read and continue to live without the confidence you need to make the decisions that will enrich your life spiritually, emotionally, physically and financially (this is known as passing up a great opportunity). Take everything you have read at face value and tell yourself that you will get back to it another time (this is known as procrastination). Act now and decide to take control of both your confidence and your life by investing in something that will have a profound effect on you forever (this is known as taking initiative). 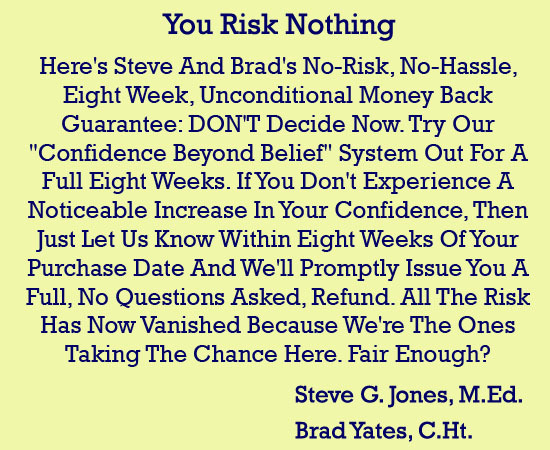 Remember, there is zero risk involved because if for any reason you are not happy with the results that I have promised in Confidence Beyond Belief, Brad and I will buy it back from you. Remember, your confidence will govern every decision and your emotions will support your confidence, there is only one way to have Confidence Beyond Belief. To Purchase For Just $79.00 $49! To Purchase For Just $89.00 $59!